Pain protects individual from harmful situations and prevents further injuries. Sometimes pain itself can become a problem creating its own disability. Any person who has suffered from pain knows its power. The person loses mobility to the extent that even minor movement can further increase the pain which leads to serious consequences. Aoushadha ,The Pain Relief Zone is headed by Prabhu Thilak who has a solid experience in Pain Management Theraphy. 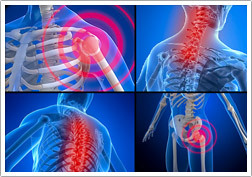 TPRZ aims at providing relief from Pain and reduce the stress level of the patient. TRRZ helps patients and families to understand the cause of pain and teach them the ways to manage it. The control of pain or discomfort through medication, stress reduction, relaxation, exercise, massage, heat, cold, or providing a comfortable environment.This branch of medical science deals with treating chronic and acute pain. Pain management is a treatment designed to ease chronic pain to enable a patient to have a better quality of life. Pain management can include medications, exercises, relaxation techniques and most importantly managing pain with interventional techniques like Ozone for Osteoarthritis (OA), Ozone Discectomy, Radio Frequency Ablation (RFA) etc... Pain management (also called pain medicine; Algiatry) is a branch of medicine employing an interdisciplinary approach for easing the suffering and improving the quality of life of those living with pain. The typical pain management team includes medical practitioners, clinical psychologists, physiotherapists, occupational therapists, and nurse practitioners.Pain some times resolves promptly once the underlying trauma or pathology has healed, and is treated by one practitioner, with drugs such as analgesics and (occasionally) anxiolytics. Effective management of long term pain, however, frequently requires the coordinated efforts of the management team. Medicine treats injury and pathology to support and speed healing; and treats distressing symptoms such as pain to relieve suffering during treatment and healing. When a painful injury or pathology is resistant to treatment and persists, when pain persists after the injury or pathology has healed, and when medical science cannot identify the cause of pain, the task of medicine is to relieve suffering. Treatment approaches to long term pain include pharmacologic measures, such as analgesics, tricyclic antidepressants and anticonvulsants, interventional procedures, physical therapy, physical exercise, application of ice and/or heat, and psychological measures, such as biofeedback and cognitive behavioral therapy. The exact medications recommended will vary with the country and the individual treatment center,but Pain-management could entail everything from physical therapy, exercise and mental- swiss replica watches health counseling â€” to surgery and medication.The following gives an example of the WHO approach to treating chronic pain with medications. If, at any point, treatment fails to provide adequate pain relief, then the doctor and patient move onto the next step.